Alright you no-good, lousy, putrid-smelling, and most importantly, vile and disgusting human beings, let’s get serious. Alright you no-good, lousy, putrid-smelling, and most importantly, vile and disgusting human beings, let’s get serious. I love exploitation movies, I love grindhouse movies, I love anything wacky and not-serious and most importantly, I love movies that are made for the sole purpose of entertainment. When these elements are incorporated into music, it reeks of that sepia filter and abandoned drive-ins with that popcorn buttery smell. 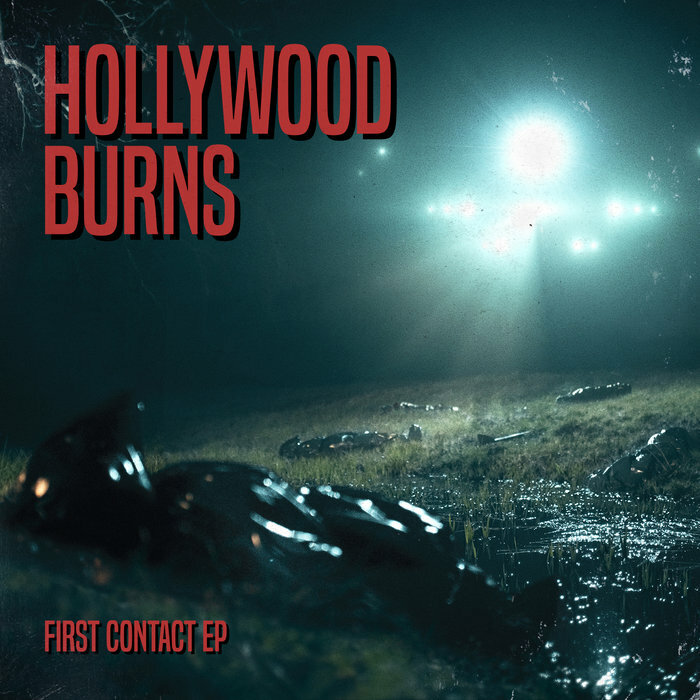 Hollywood Burns, aka Emeric Levardon, is a masterpiece of grindhouse sounding music. It’s drenched in 80’s, birthed from a Grindhouse mother and a sci-fi father. This is his debut EP teased back in December with his “Californian Nightmare” single. This…is the “First Contact EP”. To begin us off isn’t a Ferrari Testarossa, nor a muscle-bound hero in a letterman jacket, it’s an all out invasion of not your privacy, but the entire world as the 70’s knows it. “Black Saucers” is like someone gave Garth Brooks a guitar, gave him an old 50’s sci-fi movie trailer song, and gave him the finest angel dust to snort. It’s beautiful, crafted so well and with so much distortion and mixing of multiple different sounds, adding to the chaos. And boy, it gets so much better. “Californian Nightmare”, featuring an artist named Olivier Maréchal, the game goes from Dark-Synth Grindhouse to Dark-Synth mixed with that 80’s pop vibe, minus the cheesy lyrics and/or sunglasses advertisement. I could totally see a group of survivors running and hiding and watching California burn. Burn Hollywood burn, as Alan Smithee would say. The third track, “Cult Of C.”, reveals more about details into the story. Apparently, some messed up in the head former governor of California was so obsessed with science fiction novels, and so into alien research, he found a way to contact a group of genocidal human-like aliens who would happily destroy the Earth. This is why I don’t trust politics, from jerk-offs like that. There’s so much detail in each song, everything unfolds at once while so many more details appear and wait to be known. Now for my personal favorite track on the EP, “Burn Hard”, featuring Space-Synth and Dark-Synth master Volkor X, as well as bass guitarist Florent Gerbault. This song…YES. It’s just oozing of that classic 80’s power synth ballad stuff, it’s drenched in the stuff even. I defy you if you don’t love this classic track right here, hell, I defy you if you’re not on board with this EP as a whole by now. In fact, why are you still here? The “Californian Nightmare” single back in December 2015 didn’t just have one song, it had two. It’s B-side companion track was “Enter the Yakuza Club” (which I did an upload of on my YT channel, Synthpon80’s 198X, go check it out it’s not half bad). This track is very Oriental in vibe, and still very fast and dark in it’s tones. This one most definitely fits the Grindhouse scene for me, maybe in movies like Planet Terror. Now, we’ve come to the annihilation. The final showdown atop the cliffs. You shall be dashed against the stones, as Hollywood Burns has destroyed California. He “Came To Annihilate”. This is the most atmospheric and yet Dark-Synthy track of all of them. Its build-up is masterful, it’s sounds clashing together with the visions of aliens destroying everything and taking people and anything in sight. Space is the place, they say. Not for these unfortunate souls. Well, at least this EP is a reminder as well as a look back into the past of the Californian Nightmare of ’79. Go check it out, it’s sublime. No, I’m serious.